Beautiful Marilyn Monroe Bedding Sets and Comforters! If you or someone you love is a serious fan of Marilyn Monroe, then you are going to go absolutely CRAZY with these gorgeous Marilyn Monroe bedding sets! *This one is a stunning brushed twill Marilyn Monroe duvet cover set available in three sizes either with or without the pillow shams. Her face is beautiful as always and the colors are amazing! I am beyond happy to create this fan page today, since I myself am a fan of hers and I also know many people in my family who also love Marilyn, so I can’t wait to show them what I found! 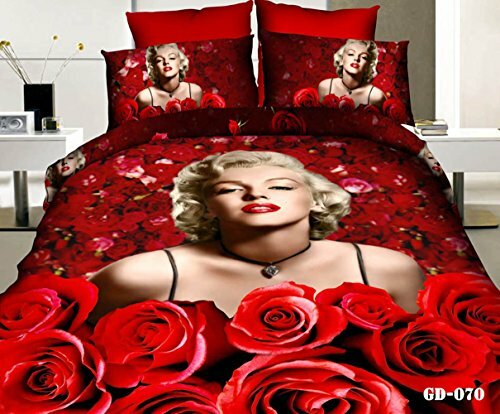 There is nothing to say but ‘Wow’ when you see this stunning and very RED 3D Marilyn Monroe bedding set for sale! 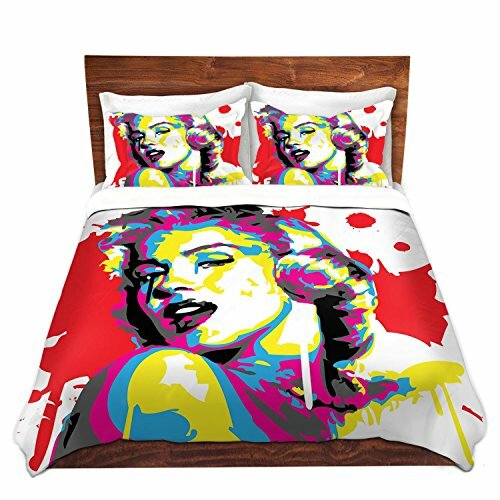 The good news about this beautiful bedding set, besides being Marilyn, of course, is that is also affordable, since you are getting 4 pieces, including the gorgeous Marilyn duvet cover, one flat sheet and two pillow cases! It is also made from 100% cotton. *I love how all the colors ‘pop out’ in that white bedroom! A beautiful and affordable black and white(except for her gorgeous red lipstick) queen size Marilyn Monroe bedding set! It also comes with the flat sheet and pillow cases! 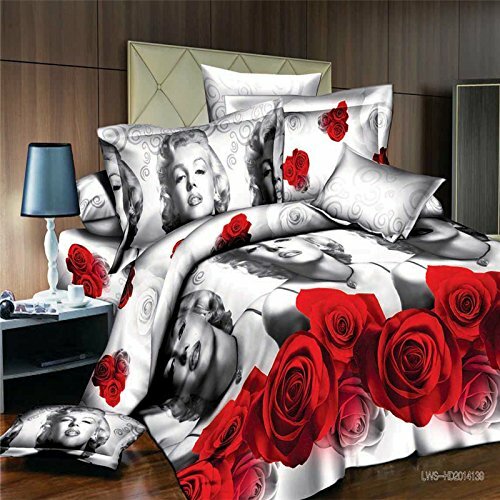 Another gorgeous 3D Marilyn Monroe bedding set for sale! This one is mostly in black, red and green! Marilyn’s face is again among beautiful red roses and she is also wearing her famous red lipstick. You can get this set in three different sizes with or without the insert comforter and with two or four pillow cases. This is a stunning 3D white Marilyn Monroe 4-piece bedding set for sale! She looks as beautiful as ever wearing a gorgeous necklace and her red lipstick. I also LOVE the gorgeous matching pillow cases! Artistic Marilyn Monroe Brushed Twill Duvet Cover Set! 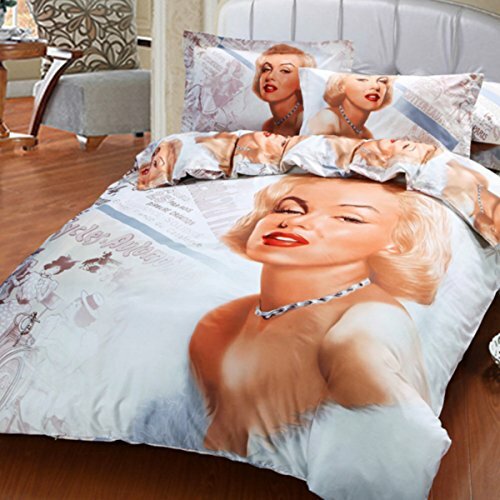 The Most Unique Marilyn Monroe Bedding! 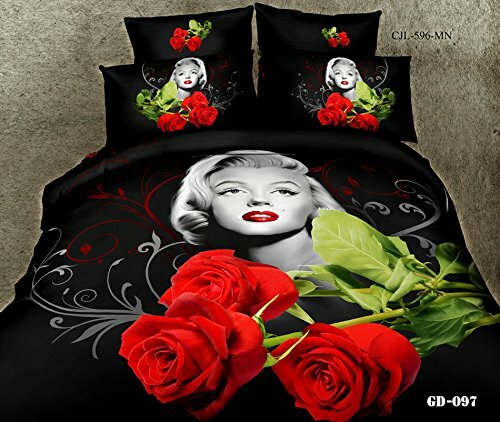 This is such a fun and gorgeous artistic Marilyn Monroe bedding set! This creative Marilyn duvet cover set is available in twin, queen and king sizes and also with or without the pillow shams. Make sure you choose the right size and option for you! This is a beautiful 5-piece full size black and white Marilyn Monroe duvet cover set with gorgeous big red roses prints! It comes with the flat sheet, pillow cases, duvet cover and a comforter filler. 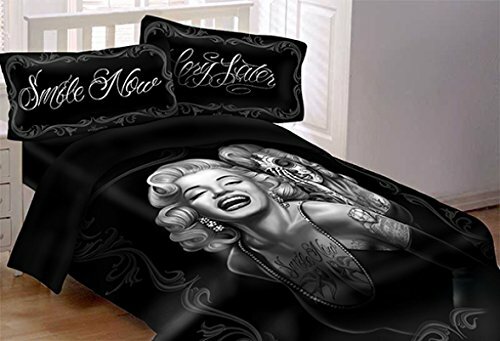 This is a cool and fashionable Marilyn Monroe queen size black comforter set that is perfect either for a woman’s bedroom or a man’s! It’s fun and it also comes with the two cool pillow shams with the message ‘Smile Now’ ‘Cry Later’! Gorgeous and Affordable Ballerina Dress Marilyn Monroe Plush Throw Blanket! 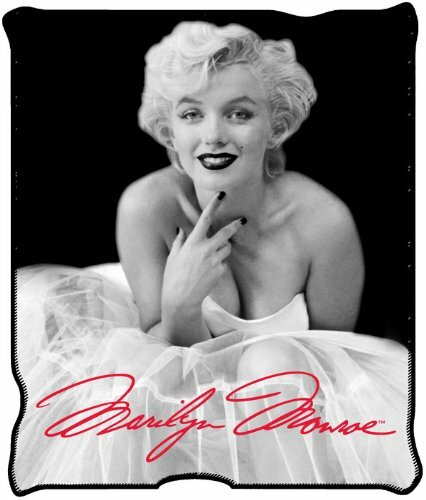 And last, but not least, a gorgeous, fun and very affordable Marilyn Monroe plush throw blanket for sale! Great Marilyn gift idea too! It’s very warm and soft as well! Coolest 3D Duvet Cover Sets!